It's nearly that time of year again. Our design students are midway through their final projects, and the graduating class are gearing up for the annual Industry Night & Show on June 9th. For the second year running, we'll be exhibiting at the prestigious Fruitmarket Gallery in Edinburgh. 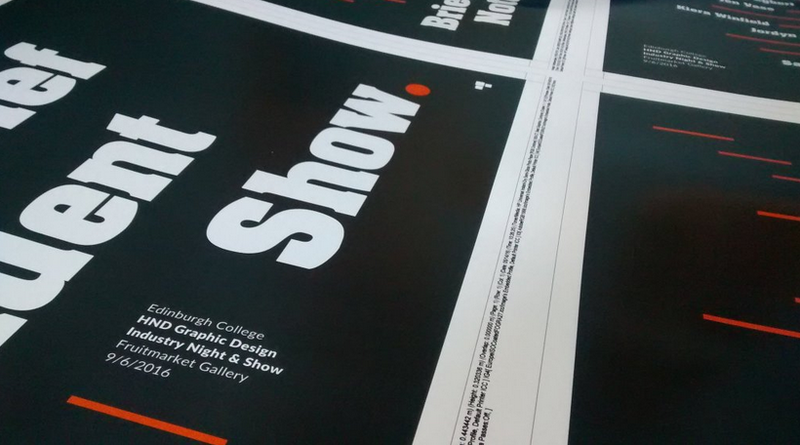 The event is part of the 'Glow Festival' - a month-long celebration across Edinburgh College featuring a number of exhibitions, show nights and events at venues around the city. This year our one-night event, entitled 'A Brief Student Show', will feature brilliant graphic design work from our Class of 2016, plus video and design work from our Partnership and mentoring projects, and winning competition work. As usual, there will be refreshments, a great DJ, and upwards of 200 designers, educators, employers and graduates past and present to network with. To let us know if you can attend the show, go to www.etcshow.net and follow the brief. We'll be posting out print invites (sponsored by G.F Smith) to agencies and individuals once our list is complete.